Cleanse: Soap-free formula deep cleanses without causing dryness. Anti-oxidant synergistic tea blend soothes inflamed skin, leaving it soft and smooth. Targeted Care: A special serum is applied to all affected areas using an effleurage massage and steam to prep skin for extractions. 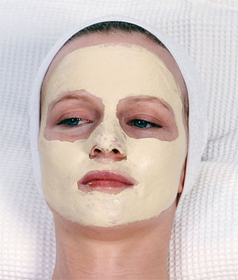 Tones: Salicylic acid helps control excess oil and unclog pores. Synergistic tea blend and powerful anti-oxidant forumla soothes and calms the skin. Calming Mask: Containing both Buttermilk and a calming synergistic Tea Blend. This mask is both cooling and soothing.